Annual Arctic temperature in 2016 was the hottest in the observational record since 1900. The 2016 anomaly was double the magnitude of the prior hottest year that occurred in 2015. In a new study published in Weather and Climate Extremes, CIRES and NOAA researchers at the ESRL Physical Sciences Division used climate models to understand the factors responsible for the record 2016 Arctic warmth. 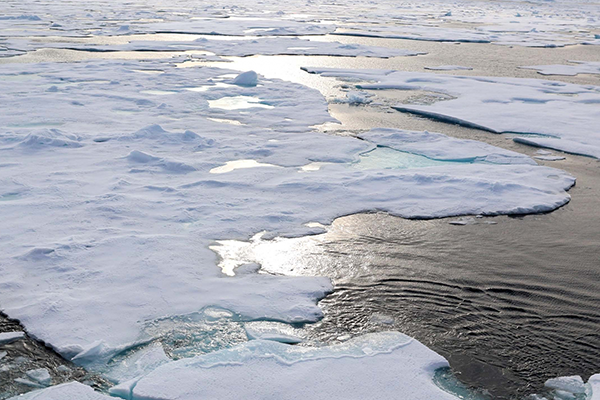 A unique design of experiments permitted investigation of the separate and combined effects of long-term climate change, Arctic sea ice loss, and natural variability. The researchers’ results show that the record magnitude of the 2016 Arctic warmth could not have occurred under 19th century climate conditions. Nor could they have occurred under 2016 climate conditions that do not include the Arctic sea ice loss. At least three quarters of the magnitude of 2016 Arctic warmth resulted from long-term changes in ocean and sea ice conditions, and about one third of this boundary-forced Arctic warmth originated from drivers existing outside the Arctic. The 2016 record warmth was found to be irreconcilable with natural variability of weather and climate. A condition of such extremity could not have arisen without a human-induced change in climate. Further, the study suggests that the 2016 extreme Arctic warmth may become the typical Arctic climate condition within a mere few decades. Authors of "Drivers of 2016 record Arctic warmth assessed using climate simulations subjected to factual and counterfactual forcing" are: Lantao Sun, Dave Allured, Martin Hoerling, Lesley Smith, Judith Perlwitz, Don Murray, and Jon Eischeid of ESRL's Physical Sciences Division.